ABC airs reruns of MODERN FAMILY and THE MIDDLE. The pilot episode of MODERN FAMILY is up first, followed by the episode of THE MIDDLE where Axel breaks the front door. Over on CBS, check out an all new episode of THE NEW ADVENTURES OF OLD CHRISTINE and GARY UNMARRIED. On CHRISTINE, Mr Harris is back and it causes some trouble in her new relationship. On GARY, Gary worries about dating his boss. FOX has an hour of AMERICAN IDOL. NBC has an all new episode of MERCY with guest stars Kelly Bishop and Eva Amurri! Check out a rerun of the LIFE UNEXPECTED pilot The CW – now’s your chance if you missed it the first time. On ABC, there’s all new episodes of MODERN FAMILY and COUGARTOWN. On MODERN FAMILY, Jay’s friend is gay, at least according to Cameron and Manny’s date gets a makeover from Gloria! On COUGARTOWN, Jules and Bobby share an intimate moment! CBS has an all new episode of CRIMINAL MINDS – the team investigates a small Wyoming town with a high amount of teen suicides. LAW AND ORDER: SVU is a rerun on NBC – this is the episode where Eric McCormack guest stars! 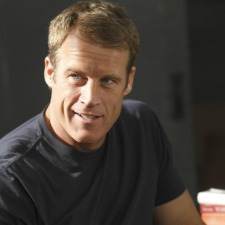 FOX has an all new episode of HUMAN TARGET that finds Chance on a plane and saving the day. The CW airs a rerun of the Halloween episode of GOSSIP GIRL. GHOST HUNTERS INTERNATIONAL is all new on Syfy with a trip to the Australia Quarantine station. DOG THE BOUNTY HUNTER is all new at 9:30 on A&E. There are two new episodes of MEET THE BROWNS on TBS. ABC has an all new episode of UGLY BETTY – Betty has a karaoke party for her fellow tenants, and there’s blackout all over NY. CBS has an all new episode of CSI: NY that has the team investigating the death of a lingerie football league quarterback. LENO is new on NBC. LAUNCH MY LINE is all new on Bravo – the designers need to make a three piece suit. On MTV, you have another episode of THE REAL WORLD: DC – the tension between Mike and Ashley turns hostile! NIP/TUCK focuses on a facial reconstruction after a suicide attempt. TBS also has new two new episodes of MEET THE BROWNS. TNT has an all new episode of LEVERAGE – the gang teams up to save the bar. STEVEN SEAGAL: LAWMAN is all new on A&E. Most importantly, check out the season 2 premiere of BEING ERICA on Soapnet. Following up on last season’s finale, and Dr Tom’s breakdown, Erica tries to end her therapy and she ends up back at her COYOTE UGLY-type establishment, helping Dr Tom in the past and learning more about him in the meantime.